On to next 365 days of workers fights! Bosses fail to block carpenters fight in S.F. The Crisis has Barely Begun! 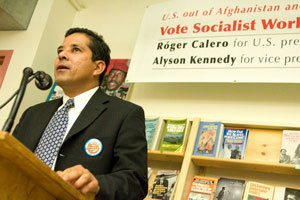 Róger Calero, SWP presidential candidate, speaks November 4 at campaign rally in New York. MERCED, CaliforniaHow a revolutionary movement can come about in this country and the role of trade unions were among the questions asked during an October 28 meeting here at the University of California for Socialist Workers Party vice presidential candidate Alyson Kennedy. UC Merced is located in the heart of the agricultural fields of the San Joaquin Valley, home to thousands of farm workers and their families. The foreclosure rate in Merced Country is one of the highest in the country and unemployment exceeds 10 percent. The meeting to hear about the socialist campaign was chaired by UC Merced student Rafael Maravilla, who introduced Kennedy and Lea Sherman, SWP candidate for U.S. Congress in the 8th District. After Kennedys presentation, one of the students asked how a movement to replace the capitalist government with a workers and farmers government could come about, if the socialist movement today is small. As this crisis deepens, the first reaction of many is to be stunned, shocked, Kennedy replied. Workers know its serious, but they dont know what to do yet. But as was the case during the Great Depression of the l930s, battles by workers against declining wages, speedup, and unsafe conditions on the job will start spreading. Workers will have no choice except to fight. How to strengthen the unions was a focus of discussion at another campaign event, a barbecue hosted on October 25 by José Sandoval, a leader of the fight for immigrant rights in San Jose, California. Among those attending were workers who helped build the May Day marches in San Jose demanding legalization of immigrants. One of the workers, who was recently laid off, said the union officials at his workplace had accepted a situation where some workers were hired on a temporary basis, with fewer rights and benefits. This caused a division between the permanent and the temporary workers. We have to transform these unions, Kennedy said. We have to remember the union is not the same as the officialsthe union is us and we can fight against these divisions. She pointed to the example of Black and Latino union carpenters in San Francisco who united to fight the racist practices of the construction companies (see story on front page). A retired worker, Cecilio Santillana, spoke about his experiences as a former bracero, one of the hundreds of thousands of so-called guest workers who came to the United States during and after World War II to work on the farms and railroads. Santillana has participated in efforts to get back the 10 percent of the braceros wages that were withheld and sent to the Mexican government, supposedly to be put into savings accounts. The money was in fact never returned to the workers. He said the recent settlement in a class-action suit on behalf of the braceros is too little, too late. The settlement opens the way for some braceros to receive approximately $3,500, if they can provide original documents to show they worked as braceros from 1942 to 1946. NEWARK, New JerseyRóger Calero, Socialist Workers Party candidate for U.S. president, spoke at two colleges, addressed a group fighting police brutality, met with several Ecuadorian day laborers, and spoke at a well-attended Militant Labor Forum here at the end of October. An interview with Calero was featured on the front page of the Brazilian Voice, a Portuguese-language biweekly with a circulation of 50,000. Calero addressed a meeting of the African Student Union at the Rutgers Newark campus and a class the following day where supporters of the Green Party and Ralph Nader had previously spoken. Sara Lobman, Socialist Workers Party candidate for U.S. Senate in New Jersey, stayed at Rutgers to field a wide range of questions, while Calero left to address a meeting of the Peoples Organization for Progress, a group opposing police brutality and other government attacks. Calero opened his presentation by thanking the organization for its support for his successful fight against the governments effort to deport him in 2003. Many of those at the meeting gave Calero a standing ovation at the close of his remarks. At the end of the day Calero met four day laborers originally from Ecuador for a political discussion at a local restaurant. SEATTLEAlyson Kennedy spent October 29 on the picket lines of striking machinists at Boeing plants in Seattle and Renton, Washington. The machinists voted to end their strike and accept a proposed contract settlement on November 1. Workers had mixed views on the tenative contract agreement by union officials with Boeing. Some told Kennedy they believed more could have been won, while others felt that the contract was the best that could be won given the state of the economy. NEW ORLEANSSupporters of the Socialist Workers Party campaign in Louisiana organized a tour here October 30-31 for Alyson Kennedy, SWP candidate for vice president. Kennedy campaigned at Tulane and Loyola universities, spoke at a coffeehouse meeting in the Upper Ninth Ward, and addressed a local coalition fighting for public housing. Kennedy was invited back to Louisiana by three New Orleans electorsHoward Allen, Mike Howells, and Eloise Williamswho were among nine electors who had successfully put the SWP presidential ticket of Róger Calero and Kennedy on the ballot in Louisiana. Howells and Williams organized area events for the candidate. Howells, a leader of the Concern, Community, Compassion/Hands Off Iberville Coalition, which fights for public housing, spoke at the groups meeting. Iberville is one of the public housing developments in this city threatened with demolition. The Socialist Workers Party is the only campaign to call for an immediate and massive program of public works to begin to solve some of the really big problems we face here in New Orleans, Howells said. Kennedy also spoke to a political science class of 20 students at Tulane University. She was invited by Asst. Prof. Brian Brox. Her tour ended with a community meeting at a neighborhood coffeehouse in the Bywater district of the Upper Ninth Ward. NEW YORKThe Socialist Workers campaign won this election, said campaign director Norton Sandler at a lively election night celebration here November 4. Joining him on the platform were the SWP candidates for U.S. president and vice president, Róger Calero and Alyson Kennedy. The New York campaign offices were decorated with balloons, streamers, and displays of media coverage of the campaign, as well as photos taken by a young woman from Italy studying here who joined the socialists for an afternoon of street campaigning a few days earlier. A potluck dinner of stews, salads, fruits, and sweets kept everyone going back for more. A young man from the Caribbean island of Grenada took part in the festivities, along with his cousin. One of them had met socialist campaigners earlier that week at a literature table in the Crown Heights section of Brooklyn. Also participating were a garment worker and a construction worker who were among the dozens of workers and youth who circulated petitions this summer to get the SWP on the ballot here. Joining the celebration via phone hookup were socialist campaigners in 17 other cities in the United States and CanadaAtlanta; Albuquerque, New Mexico; Boston; Chicago; Des Moines, Iowa; Hartford, Connecticut; Houston; Los Angeles; Miami; Minneapolis; Montreal; Newark, New Jersey; Philadelphia; Salt Lake City; San Francisco; Seattle; and Washington, D.C.
Our hard work paid off, said vice presidential candidate Kennedy. We won ballot status in 10 states and official write-in status in three more. Twenty-five percent of the U.S. electorate could vote for the national SWP ticket in this race. Campaigners for the party put in thousands of hours petitioning for ballot status across the country. The socialists also ran 33 candidates in 12 states and the District of Columbia for city, state, and federal offices, Kennedy pointed out. In four states local SWP candidates were on the ballot and they were official write-ins in two more. Crews from a Latvian and a Finnish television station covered the celebration, an example of the kind of response the socialists received from a wide range of radio, television, and print media in the course of the race. The response to the socialist campaign was especially strong among youth, said Kennedy, who had flown in that day from Minneapolis, where she addressed a class of 60 students at the University of Minnesota. Building on that, she reported, Minnesota socialists are helping organize a meeting on that campus November 19 to discuss the Pathfinder book Our History Is Still Being Written: The Story of Three Chinese-Cuban Generals in the Cuban Revolution. The feature speaker at that meeting is Martín Koppel, who was one of the SWP candidates for Congress in New York. Kennedy said she had spoken by phone the day before to Martina Correia, sister of Troy Davis, an African American on death row in Georgia who was framed up for the killing a cop in 1989. Seven of nine witnesses in his case have recanted or changed their testimony. I encourage everyone here to continue the fight to free Troy, said Kennedy. In closing the rally, Sandler encouraged everyone to attend the public meeting on The Crisis Has Barely Begun! and Workers Fight to End the Wages System Is Posed scheduled for the Robert Treat Hotel in downtown Newark November 22. The featured speakers are Jack Barnes, national secretary of the Socialist Workers Party, and Mary-Alice Waters, editor of New International magazine and recently returned from Equatorial Guinea.